This e-learning package, developed by Health Education England and Skills for Health, provides uniformity and relates directly to the good working approaches included in the guide produced by the Care Quality Commission. The aim of the e-learning is to encourage a learning and quality improvement culture within the health and care sectors. It helps organisations remove barriers and enable a change in culture whereby all learning opportunities are taken. This in turn will result in improvements in care. If you already have an account with e-LfH, then you can enrol on to the Learning from Deaths programme by logging in to the e-LfH Hub, selecting My Account > Enrolment and selecting the programme. You can then access the programme immediately in the My e-Learning section. 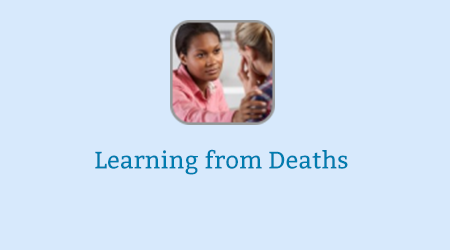 To register for the Learning from Deaths programme, select the ‘Register’ button above. Select the option ‘I am a care home or hospice worker’ then enter your care home / hospice name or postcode and select it from the options available in the drop down list. Finally enter your care home / hospice registration code and select ‘Register’. You may need to see your employer to get this code. Access to e-LfH content is available to all social care professionals in England whose employers are registered with the Skills for Care National Minimum Data Set for Social Care (NMDS-SC). Every employer providing NMDS-SC workforce information to Skills for Care has been given a user registration code for their staff. This code enables you to self-register for access to the Learning from Deaths programme. Please contact your employer for more details about the registration code. For information about registering your organisation with the NMDS-SC your employer should access www.nmds-sc-online.org.uk or contact the Skills for Care Support Service on 0845 8730129.